$10,000,000,000 and I won’t see a dime. Through the application of eligibility restrictions, which include enrollment, a minimum GPA, amateur athlete status (no financial reward for competition), the NCAA is able to exert its “domina[nce]” and impose “moral leadership” over the student athletes by forcing them to conform to the established system (Gramsci 75). Before they can ever compete or even practice with their teams, student-athletes must sign a waiver of acknowledging the NCAA’s eligibility rules, and consenting to their application. By signing this document, the player signs away his right to any financial or material reward for his or her contributions to the team, the rights to use his or her image on promotional materials. The student-athlete also agrees to the NCAA’s right to drug test them at any NCAA event. Thus the NCAA is able to secure a workforce and their media rights, without having to pay them a dime, all whilst holding them personally accountable for following the NCAA’s rules to the letter and attending school. The NCAA can then sell the rights to broadcast NCAA competitions and funnel the profits directly to the member institutions without ever having to pay the players a dime. 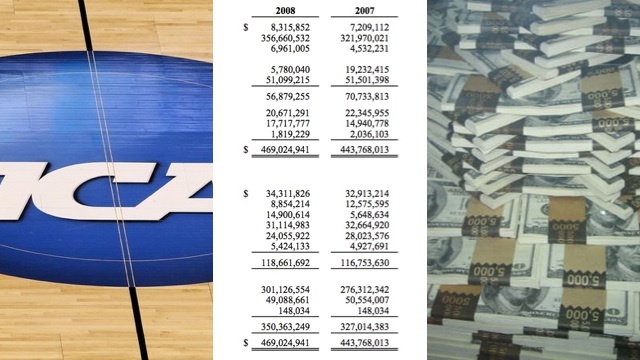 For example, in 2010 the NCAA sold the media rights to broadcast thousands of collegiate athletic competitions through the year 2014 to CBS/Turner for $10.8 billion dollars (NCAA.org/finances). Technically, the NCAA “does have and request consent” from its athletes before profiting from their image and endeavors, but “it also ‘educates’ this consent” by limiting the players other athletic options, meaning that the content of the agreement is left to the private initiative of the ruling class” and contains no input from those who sign it (Gramsci, 79). By enforcing the rules of amateurism, and coercing the cooperation of student-athletes across North America, in effect commodifying their athletic pursuits, the NCAA is able to ensure unbelievable profits for its Member Institutions, all without having to compensate the student athletes. Therefore the NCAA functions as a perfect hegemony, able to exploit its athletes, whilst restricting their ability to to do the same.